The Alaska Rural Utility Collaborative (ARUC) is a statewide program that partners with communities to manage, operate and maintain water/sewer systems in rural Alaska. There are two types of memberships within the ARUC statewide program—the Assisted Billing Program and the full ARUC membership program. 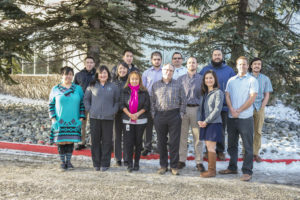 The ARUC Advisory Committee serves as the liaison between ARUC and the participating communities, and provides advice and recommendations to ANTHC and to participating communities. The functions of the Advisory Committee are to: promote functional, safe and well-maintained sanitation facilities for participating communities; promote greater community and regional involvement in ARUC programs and activities; promote fair and equitable representation of utility customers; support development of comprehensive plans to assist participating communities in assuming responsibility of sustainable utility operation and annual generation of revenue to cover necessary community expenses; annually review and set financial, rate and policy recommendations for ARUC’s budget and individual budgets for participating communities based on the level of service provided; facilitate communications between the ARUC and participating communities; and promote sustainability and community and customer involvement in ARUC communities. Many communities subsidize their water/sewer system from a community general fund. ARUC works with community partners to set self-supporting water/sewer rates and consistently bill local water and sewer customers, so the community no longer needs to subsidize from their general fund.In addition to billing services and collection, the full ARUC Membership provides management and operations of the water/sewer system. ARUC assists partner communities with hiring local water plant operators (and backup operators). Before a community can become eligible for consideration into the full ARUC Membership, they must be a member of the Assisted Billing program for a minimum of one year. The Assisted Billing program provides enrolled communities with water and sewer system billing services and collection from customers. The program was developed to provide consistency by keeping a steady and accurate utility billing schedule and help rural communities generate revenue. Fees are collected and refunded to the community (minus the monthly service fee).